Follow this guide for some on-site insight. Before we go inside, take a look at us from Salamanca Place by standing in front of the main entrance at number 77 (under the Long Gallery sign) . The Salamanca Arts Centre extends from the building to the left of Kelly’s Lane (Aspect Design is on the ground floor) up to the top of Kelly’s steps (1 – 3 Kelly St), along Salamanca Place to Montague Lane (Wooby’s Lane) – Gallery Salamanca is on the ground floor corner – into Salamanca Square and includes everything between these four points. As you look from ground level to the top of the buildings, you’ll see doorways which were used originally as bays for loading goods into the buildings. Beams protruded at the top of the buildings immediately above these doorways and goods were hoisted by pulley from the footpath or off the back of horse-drawn carts in through the loading bays on each floor. In some places in Salamanca Place, these mechanisms are still visible. Now let’s get moving! Looking through the double entrance doors, you will see the staircase in front of you. Before you enter the building, take a moment to note the unused glass door into Handmark Gallery to your immediate left. This was the door that accessed the original staircase. To your right is the Lightbox, available to artists by application to exhibit small-scale installation work. Exhibitions change every month. Walk to your left past Handmark Gallery to Kelly’s Lane. Turn right and walk up Kelly’s Steps, constructed in 1840. (Note the “Bridge of Sighs” above you as you walk under it.) At the top of the steps on the right hand side you will come to SAC’s Artist’s Cottage. This historic convict brick cottage is used as a residence for visiting artists, writers, designers and performers. From here at the top of Kelly’s Steps, you have a birdseye view of SAC. From Kelly’s Garden Installation Space behind the steel gate on Kelly’s Lane, and the building beyond fronting Salamanca Place, from your right to left to one building beyond the old lift well jutting into the sky are part of SAC! Immediately left of Kelly’s Lane looking down is the Peacock Theatre, and behind it is the roof of the lift, commissioned in December 2008. Retrace your steps into Kelly’s Lane to Kelly’s Garden to the right. The historical origins of this garden are unclear, but the area was once roofed. See if you can “read” this history by looking at the wall on the far side of the garden. Can you spot where the roof once was? Historic photos suggest that wine barrels were constructed in this area at some time in a lean-to structure attached to the rear wall of the building at the Salamanca end of the Garden. Can you “read” the building evidence? Kelly’s Garden is an outdoor installation space featuring international, national and local artists. Stop at the first floor stair landing. On your left is Nolan Art Gallery & School. After leaving Nolan Art Gallery & School, pass by the Long Gallery to the right (we will visit the Long Gallery later) and through the green framed glass door. Pass by the Meeting Room, a Salamanca Arts Centre public access space hired out to arts and community groups for meetings and training sessions. Turning to your right, proceed up the ramp and through the glass door. Any weekday, you can enter this corridor where various not-for-profit arts organisations, artists and commercial tenants rent spaces. Walk along the corridor between them until you see a window on your left. Look out to Salamanca Place and get your bearings. You are standing over Kelly’s Lane on what is known as “The Bridge of Sighs”. To your right is Warehouse 1, and to your left is Warehouse 2. The bridge on this and the next floor provides access between these two buildings. We’ll now retrace our steps and find out more about these tenants. Tasmanian Writers Centre – offers workshops, seminars, writing resources, a library, employment opportunities, manuscript assessment services, readings and events for Tasmanian writers and readers. Kickstart Arts Inc – is a Community Cultural Development (CCD) organisation creating artistically and socially groundbreaking art with young people and their communities. Kickstart aims to invigorate and engage communities through hybrid art forms – video, audio, performance, dance, theatre, film, song and networked digital media to tell stories about the places that we live in. Next door to Kickstart Arts, behind the tenants’ kitchenette is the SAC Tasmanian Community Fund Kitchen, generously provided by the TCF so SAC can offer catering facilities for its venues. Australian Script Centre – a not-for-profit organisation promoting Australian playwrights and playwriting throughout Australia and internationally. Return to the central stairwell, re-entering Warehouse 3. Walk straight ahead to stand on the balcony overlooking Tricycle Café and the Peacock Theatre which was created in the early 1980’s by local theatre people and their supporters. On your right is a decorative work containing a timeline illustrating the transition of the warehouses from factory to arts centre. Proceed through the glass door to the Sidespace Foyer and Sidespace Gallery. The Sidespace Gallery – Practicing artists who are associate members of SAC can apply to exhibit in this gallery. It is highly suited to small to medium sized exhibitions. Adjacent to the Sidespace Gallery is the Long Gallery. The Long Gallery – Almost 40 metres long and 14 metres wide, the Long Gallery is a uniquely versatile venue used primarily for exhibitions also used at times for weddings, conferences, dinners, and performances. The vast space has exposed timber beams, whitewashed walls and wooden floors which hark back to its warehouse origins. Look at the work on show, then see if you can spot where the industrial lift used to come up through the floor. Can you see the nicks in the poles throughout the gallery where the fruit-processing workers used to store their knives between use? The Long Gallery is another public access venue (when exhibitions are showing) available for hire by application. Remember the loading bays you spotted on the outside of the buildings from Salamanca Place, which allowed the vertical movement of goods? Can you now see them from the inside? A wall originally existed across the middle of the gallery. With the advent of the factory era and introduction of industrial machinery in particular, this wall was removed to enable the horizontal movement of goods by conveyor belts and other means. As you walk around the gallery see if you can “read” the history by looking at the floor. Can you see where holes were cut into it to allow conveyor belts to move goods up from the floor below? After walking around the Long Gallery, return to the central stairs and climb to the second floor. To the right at the top of the stairs is the office of the Salamanca Arts Centre, a hive of activity where arts programs are generated and the buildings and venues are managed. The Studio Gallery, further down the corridor, is dedicated to the exhibition of work by the Centre’s resident studio artists and retail galleries. There is a changing program of exhibitions, so check SAC’s website regularly for upcoming shows . On either side of the Studio Gallery you will notice doors, some of which may be open. Behind these doors are studios with artists at work. These spaces are affordable, well situated workspaces. 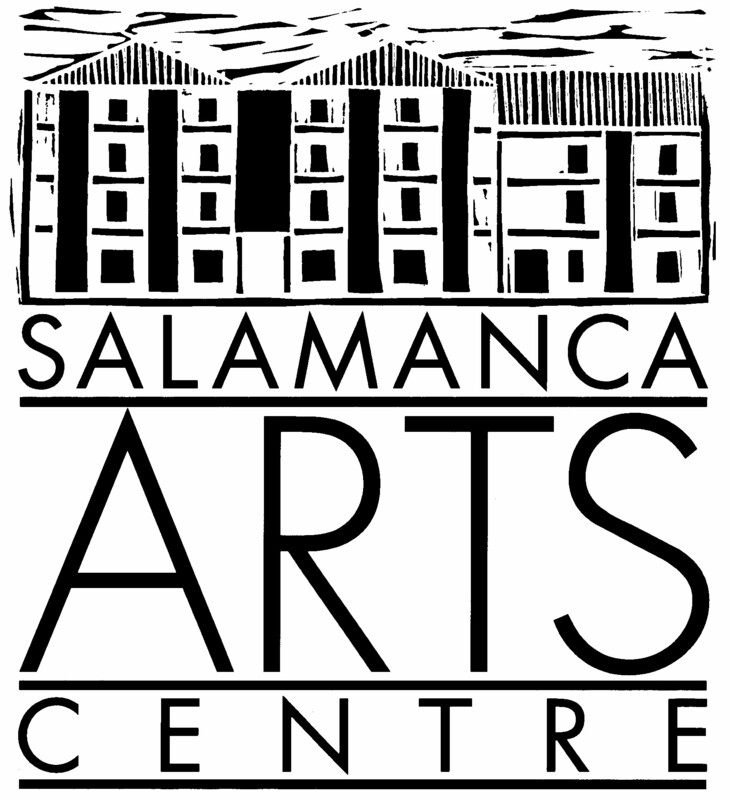 Artists’ studios and workshops are located throughout the entire Salamanca Arts Centre. The Centre provides workplaces for professional artists with emerging or established practices. Studios are also reserved for specific projects undertaken by local, national or international artists. Guidelines for Salamanca Arts Centre Artist Residencies are available from info@salarts.org.au. Return to the central stairwell, but do not go down. Climb the four steps to enter the Top Gallery, passing back into Warehouse 2 (directly above Handmark Gallery on the ground floor but 2 levels up). The Top Gallery is available to emerging professional artists to exhibit, by application. Terrapin Puppet Theatre’s office is here too. Terrapin was established in 1981 and has been operating in the Salamanca Arts Centre since that time. Behind you are the only original stairs remaining in the Salamanca Arts Centre. These lead up to the design workshop and rehearsal space where the puppets, sets, costumes, and new works are created. Terrapin creates puppet-based theatre shows, incorporating digital puppetry, for both children and adults, designed to tour locally, nationally, and internationally, such as the collaboration with the Children’s Art Theatre of China. To reach the office of the Tasmanian Theatre Company in Warehouse 1 (Aspect Design is on the ground floor of this building) again pass over the “Bridge of Sighs”. The TTC produces an annual program of mostly new Tasmanian and Australian plays. Take the ramp to your left and run your finger along the sandstone wall as you walk down. It is limewashed using an old-fashioned formula based on boiled animal fat. Modern conservation knowledge now dictates that limewash is used wherever possible on sandstone walls throughout the Arts Centre because it is porous and allows the sandstone walls to “breathe”. Modern paints suffocate the stone as air and water coming up from the ground cannot escape. That is when you get deterioration of the sandstone as the moisture pushes the paint off, taking a thin protective layer of sandstone with it and leaving salts behind on the surface to do further damage as they react with the air and stone over time. Turn left into the doorway at the foot of the ramp and walk up another ramp, arriving at a small vestibule. A counter-weighted door marks the toilets at this level. Proceed through the glass doors to your right to the Lift Balcony. You are now standing on the top balcony serving the Salamanca Arts Centre Disability and General Passenger Lift, commissioned in 2008 with funding from he Tasmanian Government. It is interesting to compare the modern lift shaft with the shaft dating from the 1940’s which is visible as you look over towards Mt Wellington. Looking down you see the Courtyard. It is the outside area surrounded by the warehouses of the Salamanca Arts Centre and a section of the quarry cliff, which extends from the Peacock Theatre and through to Salamanca Square. During the factory era this courtyard was roofed, supported on a steel structure, which was removed with the roof. On the level below is the balcony which leads to the Sidespace Gallery. The remains of the original steel beams jut out from the brickwork on the balcony, and some are also visible on the opposite side of the Courtyard. If you look across at the cliff you might notice the re-planting project taking place at the top where specialised contractors have been re-introducing agapanthus and carpobrutus (pig face) as a ground cover contemporary with gardening practice of the early Victorian period. Looking over to the Artist’s Cottage above the cliff you can see that the rear of the building, weatherboard and glass section, is a modern addition. Note that on the original brick building the windows faced the street and the back garden but not north towards the waterfront. That was because the waterfront was an industrial area at the time and the vista would have included coal-fired boilers, smoking chimney stacks and bubbling whale fat! Take the lift down to ground level. The Courtyard is a community access area and venue. You can see it in action on any Friday night when patrons gather to enjoy Rektango, a musicians’ collective who present bands playing gipsy, latin swing, ska, African and all things enjoyable – free (although they greatly appreciate a donation). Rektango is a family event. In 1999 after 23 years of operation SAC was finally in a position to redesign the courtyard incorporating aesthetics, safety, drainage and disabled access needs into the upgraded facility. Enjoy a quiet moment and see if you can once again “read” some of the history from the building fabric. Imagine what it was like when the ground was dirt or later cobbled before it was cemented and roofed during the factory era. Take note of the row of convict bricks around the edge of the courtyard between the ground cement and the sandstone walls of the buildings. Salamanca Arts Centre takes its responsibility as steward of these historic buildings very seriously. Working in cooperation with the Tasmanian Government and Hobart City Council, we have installed “evaporation strips” in several key areas to assist with the preservation of the building fabric. This row of porous bricks gives sub-surface water an easy escape route, discouraging it from entering the walls. Examine the bricks here, in Wooby’s Lane and the nearby stairwell. See how they are white to a greater or lesser degree? The salts carried in the water (the same ones that degrade the sandstone when escaping through the walls) are deposited in the bricks. The whiter bricks have been down the longest. The white discolouration shows that the evaporation strip is doing its job! The archway in the opposite corner of the Courtyard is the doorway to our third shopping arcade, housing artist Peter Barraclough, Hammer & Hand co-operative, and [spacebat gallery]. To the left of this arcade is a door which leads into Warehouse 5. This bluestone building, differing to the 4 sandstone warehouses, was originally built as the residence of the owner of the warehouses, Askin Morrison, in the 1830’s and was used as a chapel for workers in the factory. The building owner of the time was very religious and insisted on workers visiting the chapel once or twice daily. Now this building provides upstairs accommodation for more artists and arts-based organisations, generally accessible by appointment. Mezethes Greek Taverna, a commercial tenant strongly supportive of SAC and regularly displaying the work of Tasmanian artist Roger Murphy. Pass [spacebar gallery], turn left into Montagu Lane (aka Wooby’s Lane). This laneway was created when John Montagu built the first warehouse on the corner (now Gallery Salamanca on the ground floor facing Salamanca Place) in 1834. Go past Mezethes Greek Taverna, and enter Salamanca Square. Before Mezethes, this was Mr Wooby’s, the first late night coffee lounge in Hobart. It provided a meeting place for artists and a performance venue for acoustic musicians. The lift-well you observed protruding from the roof while standing on Kelly’s Steps is located within the premises and is one of the few in Australia of its era with all working parts in place making it of particular interest to industrial archeologists. On your left on the ground directly in front of you are two concrete slabs, all the evidence that remains of the two boilers that once powered the jam factory. You are now standing in Salamanca Square, which provides an excellent vantage point for viewing the bluestone building. Looking to the cliff face, the old coal chute is visible, which transported coal from Kelly Street to the boilers and machines located in the internal courtyard. This section of the quarry is unstable as when quarrying eased the owner failed to “shave” the face (drag machinery down it to remove loose bits.) SAC and the Tasmanian Government have addressed the public safety aspect of the unstable cliff by installing an innovative sculptural safety fence. This area is now known as The Backyard and is increasingly used for outdoor arts events. Head back towards Salamanca Place, past the arcade, and you will come to an arched doorway on your right. During the jam factory era rubbish was dumped out of the windows and doorways of the upper floors and dropped into this space, formerly a lightwell for the upper floors. Stairs were installed during the transformation into an art centre in the late 1970’s. These now lead to Wide Angle Tasmania which supports emerging professional film and media practitioners, and Festival of Voices (right and left at the landing respectively). At the top of the stairs on the right is The Venue, a popular facility equipped with licensed bar, dance floor, band / DJ station and carpeted seating area. Activities include dance classes, music events, performances, workshops multi-media events, conferences and seminars..
Back at Salamanca Place, turn right o see the lower courses of rendered sandstone. The render is made with lime that allows water-borne salts and minerals to be drawn out of the wall, sacrificing the render rather than the masonry. As a consequence, SAC continually replaces the render. In between Gallery Salamanca and Tasmanian Woollen Co you can observe a blank or “blind” window. This masks the position of a stabilizing partition wall behind the façade. Architects and master builders in the Georgian period (1720 – 1840) liked to maintain symmetry and rhythm in buildings, even if it required some sleight of hand! At Off Centre, look down the arcade to the cliff face on the other side of the Courtyard. You probably wouldn’t realise it but this arcade is aligned differently to the right side of the building (on Wooby’s Lane) and differently to the arcade to the left of it. SAC is shaped by the lanes that run through it and around it and as a consequence, most of the rooms in the buildings (at least on the right side of it are a strange shape (rhomboidal). SAC’s arcades are collectively known as ‘The Alcoves”. Walk on to the next arcade to come to the Peacock Theatre. Built into a natural cliff face (the one created by quarrying to source stone to build the New Wharf and these buildings), in what was an outside area between two warehouse buildings, the Peacock Theatre is ideal for musical, theatrical and dance performances as well a seminars, lectures and meetings. Adjacent is Tricycle Café & Bar with hosts Megan and Adam. During the day enjoy a coffee or lunch here and at night experience theatre, comedy or musical entertainment with a glass of wine. If you step up to the landing outside the theatre doors, you will see the interpretive artwork above your head to the right that tells the story of these buildings, and of the transformation into the Art Centre. Now that you know your way around, we look forward to seeing you here again soon because there’s always something new happening at the Salamanca Arts Centre. Thank you for taking the time to learn a little more about the fascinating buildings and history of the Salamanca Arts Centre.